One of the more popular gestures to display strength is by flexing your biceps and showing off your bulging arm muscles. After all, some of the best-known superheroes in popular culture from Popeye to Thor can be seen sporting massive guns. But aside from the obvious aesthetic appeal, having strong arms also means you are able to better engage in functional movements such as lifting, pushing and pulling. There’s this misconception, however, that if you want to develop your arm muscles, what you need is to lift massive metal weights. For the beginner, it will be difficult to perform. The good news is, you can actually start building up your bicep muscles with zero equipment. You can do so by practicing calisthenics exercises. What are the benefits of a calisthenics workout? With calisthenics, you can improve your fitness level, build muscles and develop strength just by using your bodyweight as resistance. This is very convenient because this means you need not sign up for an expensive gym membership or look for complicated equipment. You can start your fitness routine by using classic exercises such as push-ups, pull-ups, squats, lunges and more. The great thing about these exercises is that they are compound exercises. This means that you are targeting multiple muscle groups in your body at the same time. What this does is give you better muscle balance. This also saves you a lot of time because you’re working out more efficiently. Another advantage of calisthenics is that it is very flexible. You can mix and match the different exercises as well as use different progressions to create a routine that’s right for you. Aside from being a workout that you can practice just about anywhere, the routines are easily modifiable. Unlike other workouts where you have to follow a rigid set of exercises, you don’t really have to be stuck to doing an exercise if it’s not working for you. You totally have the flexibility to choose different exercises until you find the best calisthenics workout that will serve your goals and your lifestyle. Can I get big biceps with calisthenics? It is not uncommon to see lots of gym buffs who sport big biceps but at the same time, they have a weak looking back, undeveloped chest and thin, chicken legs. The reason why this usually happens is that many people, especially men, spend countless hours in the gym doing isolation exercises just to develop one specific body part. By the time they get tired of doing the exercise, they forget the importance of training the other muscles in their body. There’s nothing wrong with wanting to have big biceps but in doing so, you should also give proper attention to the rest of your upper body and lower body as well. This way you will be able to achieve a strong physique that’s also aesthetically appealing from head to toe! With a calisthenics biceps workout, you don’t need to double or triple your efforts just as you would when doing isolation exercises. As you perform bodyweight exercises that train your arms, you can also simultaneously train your chest, your back, and your core. This saves you time, as well as gives you a much-balanced form. Believe it or not, your body weight is heavy enough to give you that muscle burn and build your arm muscles. You’ll be surprised that you can definitely build muscular arms without weights as long as you are consistent in your routine and executing your workout correctly. There are many bodyweight moves that train the arms, specifically the biceps. If you are a beginner, you should first build up strength and power. You can do this by starting with moves such as push-ups, bench assisted dips, and inverted rows. Not everyone can execute a push-up correctly. In fact, there are even people who work out every single day who do not realize that their form is incorrect. When starting, don’t focus on how many push-ups you can do, instead, concentrate that you are doing every single repetition correctly. 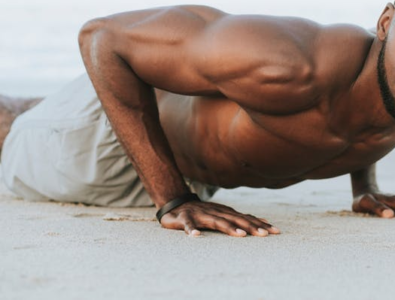 You can do an easier version of the push-up like lowering down your knees if you find that you cannot yet do a full push-up. As you build your strength, you can gradually progress to upgrade your workout. This is the same for the rest of the other exercises in this routine. The most important thing is to master the fundamental exercises first. Once you can execute each exercise with the proper form and you have built enough strength to start building up muscle, you can proceed with this circuit-type workout routine that targets your biceps and upper body. The workout below is designed for people who are ready to build muscle mass on their biceps. It is not a beginner workout because you need to be strong enough to actually complete even just one round.